Future Care Managing Director Larry Jacobson explains the approach further. “People get caught up in the various technologies and video conferencing, all of which of course enhances the quality of the diagnostic procedure. But, when you strip away all the technology, what you have left is the quality of the physician on the other end. What separates us from the competition is the quality of our network physicians. 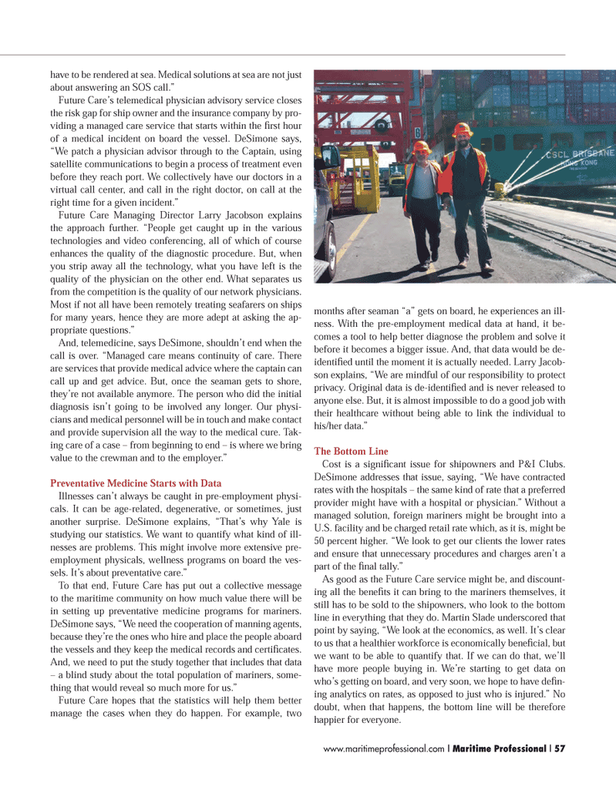 To that end, Future Care has put out a collective message to the maritime community on how much value there will be in setting up preventative medicine programs for mariners. DeSimone says, “We need the cooperation of manning agents, because they’re the ones who hire and place the people aboard the vessels and they keep the medical records and certifi cates. Cost is a signifi cant issue for shipowners and P&I Clubs.